Jay Strayer was born on August 6, 1934, in Jamestown, Ohio. He was commissioned a 2d Lt in the U.S. Air Force through the Air Force ROTC program on June 8, 1956, and went on active duty beginning July 30, 1956. Lt Strayer next attended primary flight training at Stallings AFB, North Carolina, for T-34 Mentor and T-28 Trojan qualification, and he then completed advanced pilot training and was awarded his pilot wings at Webb AFB, Texas, on October 15, 1957, qualifying in the T-33 Shooting Star, followed by Helicopter Pilot Training at Randolph AFB, Texas, from November 1957 to April 1958. His first assignment was as an H-19 Chickasaw and then HH-43B Huskie helicopter pilot with the 507th Air Base Squadron at Kinross AFB (later renamed Kincheloe AFB), Michigan, from May 1958 to April 1961, and then as an H-19B pilot with the 38th Air Base Group and in support of the 38th Tactical Missile Wing at Sembach AB, West Germany, from April 1961 to April 1964. Capt Strayer next served as an HH-43B pilot with Detachment 12 of the Western Air Rescue Center at George AFB, California, from June 1964 to October 1965, flying combat missions in Southeast Asia while on temporary duty to Nakhon Phanom Royal Thai AFB, Thailand, from January to May 1965, followed by service as an HH-43B pilot with Detachment 3 of the 38th Aerospace Rescue Squadron at Ubon Royal Thai AFB, Thailand, from October 1965 to June 1966. During this time he was also assigned temporary duty to Binh Thuy AB, South Vietnam, to establish a new HH-43 helicopter rescue detachment from February to April 1966. He served as Commander of Detachment 18 of the Central Aerospace Rescue and Recovery Center at Little Rock AFB, Arkansas, off and on from June 1966 to February 1968, and then as an HH-43B Rescue Aircraft Commander with Detachment 84 of the U.S. Logistics Group in Turkey at Incirlik AB, Turkey, from February 1968 to February 1970. Maj Strayer next completed CH-3 Jolly Green Giant and HH-53B/C Super Jolly Green Giant upgrade training from February to June 1970, followed by service as an HH-53B/C pilot and aircraft commander with the 40th Aerospace Rescue and Recovery Squadron at Udorn Royal Thai AFB from July 1970 to July 1971. During this time, Maj Strayer served as copilot aboard the HH-53 "Apple Two" during the Son Tay Raid, a clandestine mission to rescue American Prisoners of War held in North Vietnam on November 21, 1970. He next served on the AARS Inspector General's Traveling Inspection Team with the Aerospace Rescue and Recovery Service at Scott AFB, Illinois, from July 1971 to May 1973, followed by service as Commander of the 1551st Flying Training Squadron and then Deputy Director of Operations of the 1550th Aircrew Test and Training Wing at Hill AFB, Utah, from May 1973 to May 1976. 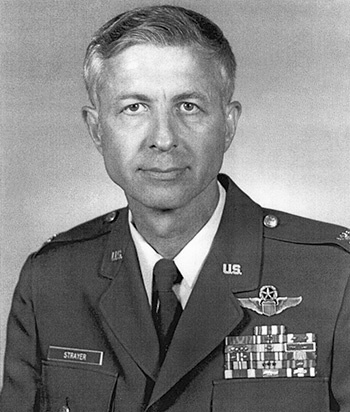 Col Strayer attended Navy War College from July 1976 to June 1977, and then served as Commander of the 3350th Technical Training Group at Chanute AFB, Illinois, from July 1977 to May 1980, where he had oversight of training of U.S. Air Force's jet engine mechanics, maintenance management/aircraft maintenance officers, Department of Defense weather observers/forecasters, and weather equipment maintenance personnel. His final assignment was as Vice Commander of the 2750th Air Base Wing at Wright-Patterson AFB, Ohio, from May 1980 until his retirement from the Air Force on February 1, 1985. Major Jay M. Strayer distinguished himself by gallantry in connection with military operations against an opposing armed force during the Prisoner of War Search and Rescue Operation at Son Tay, North Vietnam, on 21 November 1970. On that date, flying as a pilot in an aircraft carrying part of the rescue party, Major Strayer, in complete disregard for his personal safety, flew deep into enemy territory in an attempt to rescue American Prisoners of War interned at Son Tay. Completely aware of the enemy antiaircraft and surface-to-air missile threats enroute and in the objective area, Major Strayer totally disregarded his personal safety and skillfully and accurately performed his duties, thereby enabling the rescue party to arrive precisely on target. As a result of Major Strayer's heroic efforts, the force arrived at Son Tay as planned, the enemy forces were completely surprised, and the mission was successfully completed. By his gallantry and devotion to duty, Major Strayer has reflected great credit upon himself and the United States Air Force.